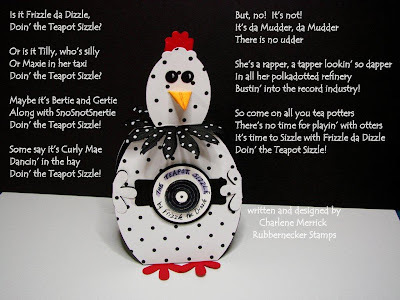 Well, rock my socks, da Muddermark has the tea potters takin' rappin' lessons this week at Teapot Tuesday with Frizzle da Dizzle! Cockadoodledoooooooo! I sure hope you kin join in on the fun with all of us! Fabulous 50s record image by Rubbernecker stamped in Memento Black and covered with Crystal Effects for shine. I used an oval Nestability for the body and a Labels Ten for her head. The boho blossoms punch was used for her comb; the flower punch for her feet and side-arm feathers; circle punches for the eyes and record; modern label punch behind the record; star punch for her nose; polkadotted silk flower for her cape around her neck. 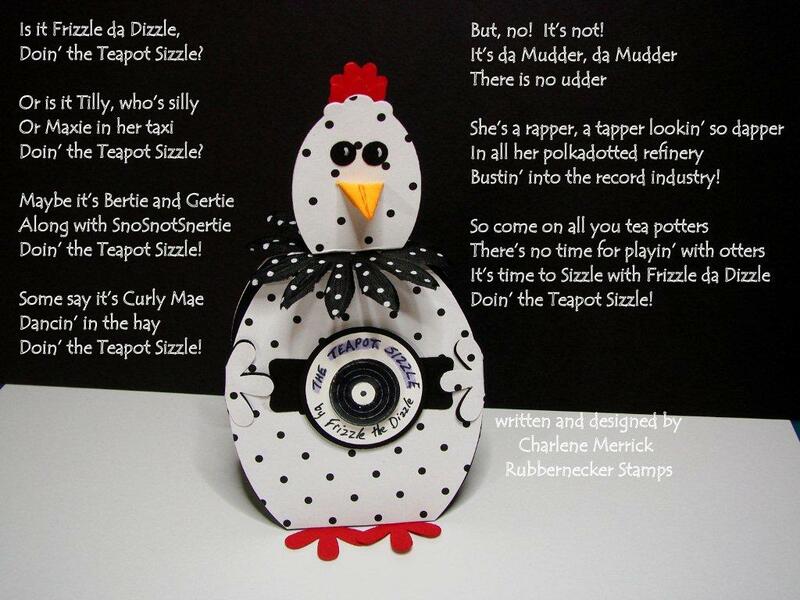 She won't be given her wattles, though, until she attains star status in the rap industry. I hand wrote the record label. Bustin' into the record industry! you are definitely one barrel of talent! love your new banner too! Hey Charlene, your banner is awesome, but who knew you were a rapper in disguise? Love your Tilly too...you did amazing things with those punches. I bow to your creativity, girlfriend! This gave me quite a giggle first thing this morning! I'm glad someone brought the rap - I was looking for it with Gertie, but she seemed to have got tongue-tied for once, LOL. That polka-dot blossom is the best!! Oh Charlene!! Love the rap!!! Too fun!! Your creation with the punches is incredible girl!! Love it!! You da bomb!! What an awesome card and your rap isn't bad, either!! You are amazing! Not only a great take on the Frizzle but perfect lyrics. Now you just need to get that Teapot Sizzle video made! I really want to see you and da mudder dressed up like rappers. Thanks for a great dose of humor! You are one, rappin, stampin, punchin Momma, gf!!!!! Your Tilly looks FABO....sure sorry I missed all the fun!!!! Hee, this was such a kick! We need to have a rappers award....betcha you would win and then you could give royalty to me! Snort! Wow, wow, wow...what a new header you have on your blog! I love, love, love it! Its so fun! Lots of great M & M treats. I am surprised there were M & M's laying around.....that you didn't eat em all before you got them photographed! Giggle!